Heat the oven to 400°. Put the broth, potatoes, thyme, salt, and pepper in a medium saucepan. Cover and bring to a boil. Uncover and simmer until the potatoes are just tender, about 5 minutes. Remove the potatoes with a slotted spoon and transfer to a bowl. Add the celery and cream to the simmering broth and cook, stirring frequently, until the celery is very tender and the cream has thickened, about 10 minutes. Add the celery mixture to the potatoes and fold gently to combine. Meanwhile, oil two 12-inch pizza pans or large baking sheets. Press the dough into a 9-by-13-inch rectangle on each prepared pan. Bake until the dough begins to brown, about 7 minutes. Spoon the potato mixture over the dough. 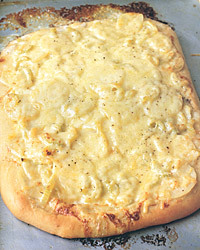 Sprinkle the cheese over the top and bake until the cheese and crust are golden, about 15 minutes. Try some thin-sliced fennel instead of some of the celery. You'll need a total of one-and-a-half cups of the sliced vegetables. Pinotage is a grape unique to South Africa. It makes a soft, juicy, berry-flavored red wine with smoky accents akin to Syrah. A Pinotage will be lovely with the Gruyère in this dish.